Known since 1886 for the fine craftsmanship of its watches, Mathey-Tissot now presents a creation combining timeless classicism with casual-chic sophistication, infused with a subtly contemporary touch: Elisir Special Edition. Presented in two 29 mm and 40 mm sizes for women and men respectively, the case exudes a sense of dynamism, accentuated by the visible screws also picked up on the bracelet. The case and bracelet feature elegant contrasts between the polished and satin-brushed finishing. A curving pattern on the dial evokes a globe motif, ringed by beautifully understated Roman numerals and hour-markers. Free of any superficial elements, this new Elisir Special Edition stages a particularly legible display of the time and date, natural becoming the indispensable companion of today’s man and woman. Quartz, Ronda 515 calibre (men’s 40 mm model) or Ronda 505 calibre (ladies’ 29 mm model). 316L stainless steel, 40 mm or 29 mm. Sapphire crystal. Water-resistant to 50 metres (5 bar / 165 ft). Silver-toned. Hours and minutes hands enhanced with Super-Luminova®. Date window at 6 o’clock. 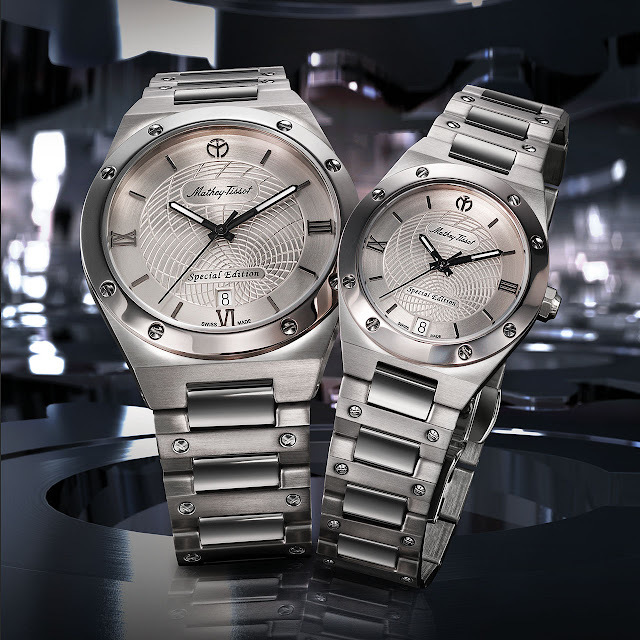 Stainless steel, folding clasp engraved with the Mathey-Tissot logo.